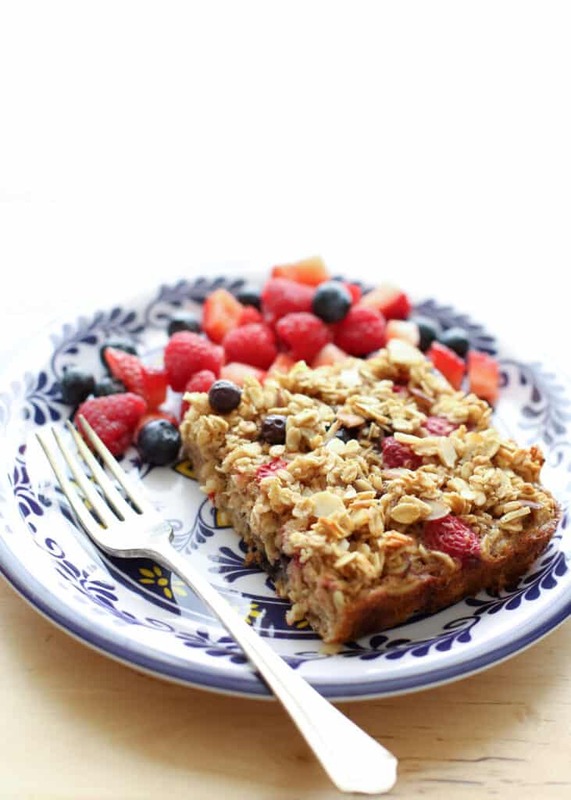 Baked oatmeal, loaded with the summer’s fresh berries and lightly sweetened with honey is a great way to start the day. With all the berries in season right now, they’ve made their way into several breakfast dishes lately. Our strawberries have been very sweet this year, so I swapped the usual sugar in the oatmeal for honey and I really enjoyed the change. The oatmeal wasn’t overly sweet and it allowed the slight tartness of the other berries to shine through. Oatmeal is one of my children’s favorite breakfasts and we’ve gathered a huge collection of great oatmeal recipes over the past few years. My youngest son loves oatmeal so much, he attempts to order it at almost every restaurant we visit. There’s nothing quite like watching the waiter’s face as he requests, “A big bowl of oatmeal, please,” while we are dining at a Mexican restaurant. Luckily, he loves chips and salsa almost as much, so it’s an easy sell. Preheat the oven to 350 degrees. Grease a 9x13 pan with butter. Stir together the oats, baking powder, salt, cinnamon, and ginger in a large mixing bowl. Pour the butter, and the honey, over the oats and stir to coat. Stir in the eggs and then add the milk. Gently fold in the berries and the almonds, if desired. Pour into the prepared pan and bake for 25-30 minutes, until a knife inserted comes out clean. Let cool about 10 minutes before serving. Enjoy! FREEZER MEAL: Let the oatmeal cool completely and then cut or scoop into portions. Store the oatmeal in airtight freezer safe bags or containers. Reheat in the microwave with a tablespoon of water. I've never tried a baked oatmeal. 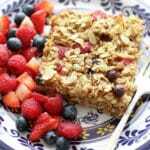 We love oats (eat granola everyday) - so I am sure we would love this too! I've been meaning to make baked oatmeal for years but never found a recipe that looked amazing. Definitely making this for my kiddos! I love your baked oatmeal recipes. It's like eating breakfast and dessert all at the same time! 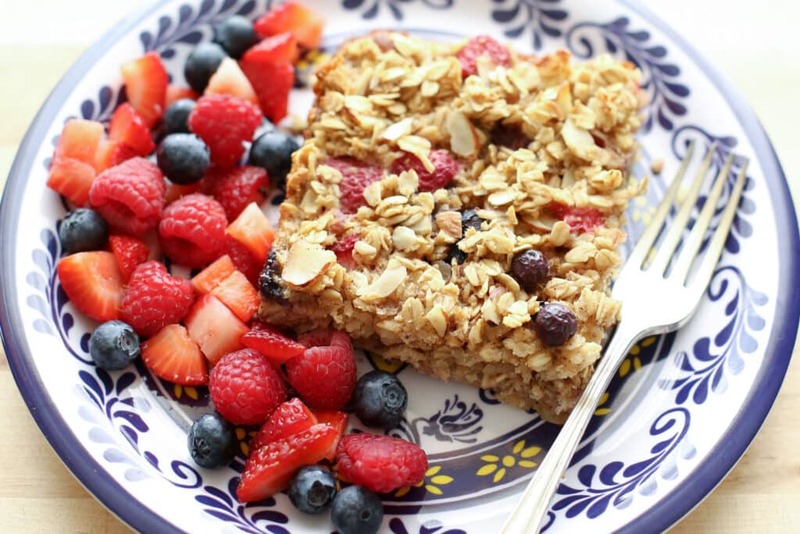 Oh how I love baked oatmeal but have never tried it with berries! This looks so good, Mary! PS these photos are gorgeous! Treats like this make me wish it was always fresh berry season! This looks incredible! I don't eat oatmeal due to texture issues, but this looks like something I would be able to eat. Could you use frozen fruit, and how well does it keep if you don't it eat it all in one day? Frozen fruit works great, just add an extra minute or two to the baking time. Baked oatmeal keeps well in the refrigerator for 2-3 days, or in an airtight container in the freezer for a couple months. I just made this and it was incredible! I cut recipe in half and used smaller pan. I used all cinnamon because I was out of ginger. I prefer sweeter oatmeal so I put brown sugar on top of it after getting it out of oven. To my daughters bowl, I added some extra milk so she could chew it better since she is used to more creamy texture. I will definitely make this again!